Sweet corn in one of the maize variety which is loved by all people.It is plucked before they are matured as maturation involves conversion of sugar to starch so as to be eaten as vegetable rather than a grain.It is said cooked corn has anti-cancer properties to try to include it in your diet.Due to the sweet taste it is a great hit among young ones.By adding salt & spice one can just eat the boiled corn or without spice.In this i have just tempered and added coconut for more flavor. 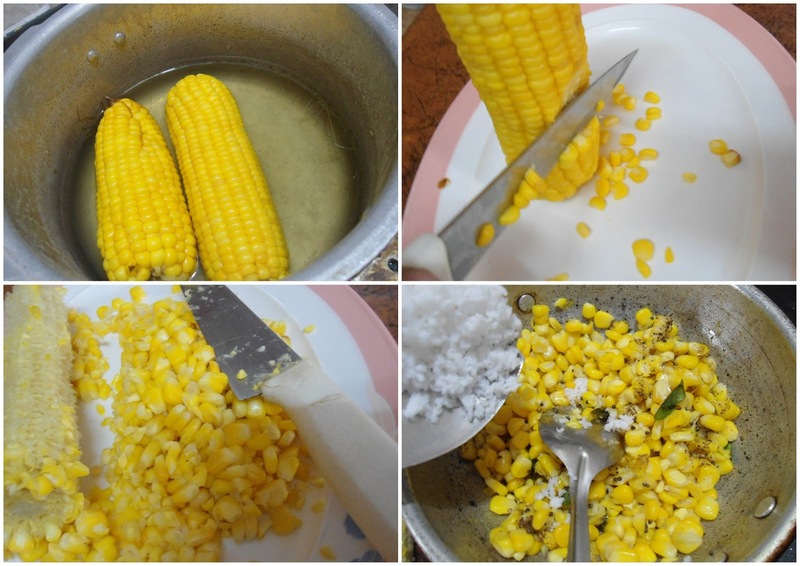 1.Pressure cook sweet corn with water for 3-4 whistle. ( you can even microwave it for 5-6 mins). 3.Heat oil a pan,pop out mustard,curry leaves.then add the corn kernels to it.Add salt & pepper powder,mix.Lastly add grated coconut and switch off. While serving add little chat masala (if using ) and serve. This Recipe is an entry to The KitchenAid India Navratri Challenge for The Hub @ Archana’s Kitchen. This is our favourite snack.. I make it often as hubby loves corn.